Wow! Post another photo after Friday's anticipated rain. This may be a topic/project in which others are interested. What are the dimensions of your roof? This is just so exciting to watch as the rain pours down...wow, is it ever coming down! I just keep saying thank you, thank you, thank you... we need it so badly! Our mobile home is 24' x 53' ... with 12' x 53" awnings down each side, so about 48' x 53' with a slight pitch running the length of it. The rain we're collecting right now is from one side of the roof + one awning... actually just the back half of that area. Estimates are from a 1000 sq ft roof and 1" of rain we should collect about 650 gallons of water. Hmmm, we'd need more barrels than we have right now! With the barrels on their sides we probably lose about 10% capacity, so some researcher wrote. Tons of stuff to learn... interesting stuff! The wind moved the downspout a bit so we missed a bunch of the water before Al went out there and fixed it again... and the gutter seems to be somewhat clogged so water is pouring over the edge of the gutter all along the front porch and not draining toward the end of the gutter and down the spout so we're not catching all the water we should be. HOWEVER... the water level is now just below the air vent fittings (the 3/4" fittings), those top bungs in the bottom barrels!!! I can't believe how fast they're filling in spite of all that's not right! It's after 11:30 pm and I'm heading for bed. Al gets up at 4am to drive a school bus and he's already asleep. It will be fun to see if the top barrels fill during the night... as hard as it's still raining, they probably will. So sad to think of all the water we're not collecting because we haven't finished the second system yet! ooooo, I think I'm getting greedy!! Oh, oh... just heard the thunder, gonna shut my computer down now. I'll post more in the morning! ... one more thing before I close down tonight. I forgot to say anything about the cost of this project! I bought those 14 barrels for about $14 each, delivered. Yesterday we bought all the supplies we need to complete the second system, bought it all at the same time at The Home Depot... $183 and change. 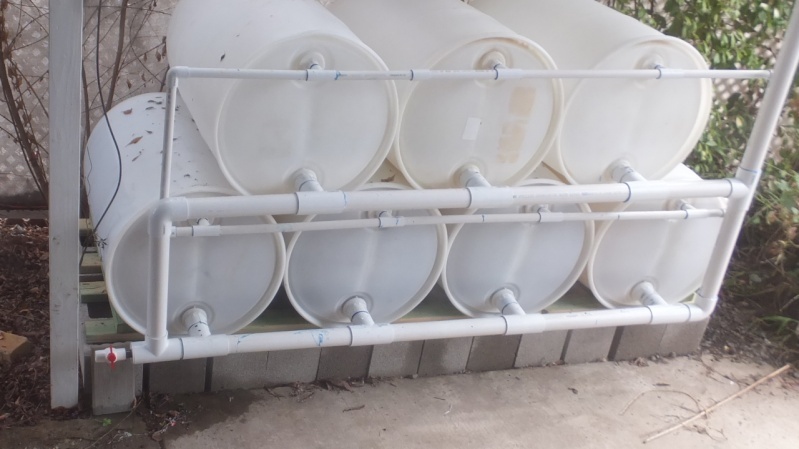 That would be 24 cinder blocks for the base; 2x4s for the runners and cross strips to cradle the barrels; all the fittings, both 2" and 3/4"; 3-2" pipes and 3-3/4" pipes; a couple of misc fittings for the spigot; the downspout and connector. Oh, and the glue and silicon sealant. 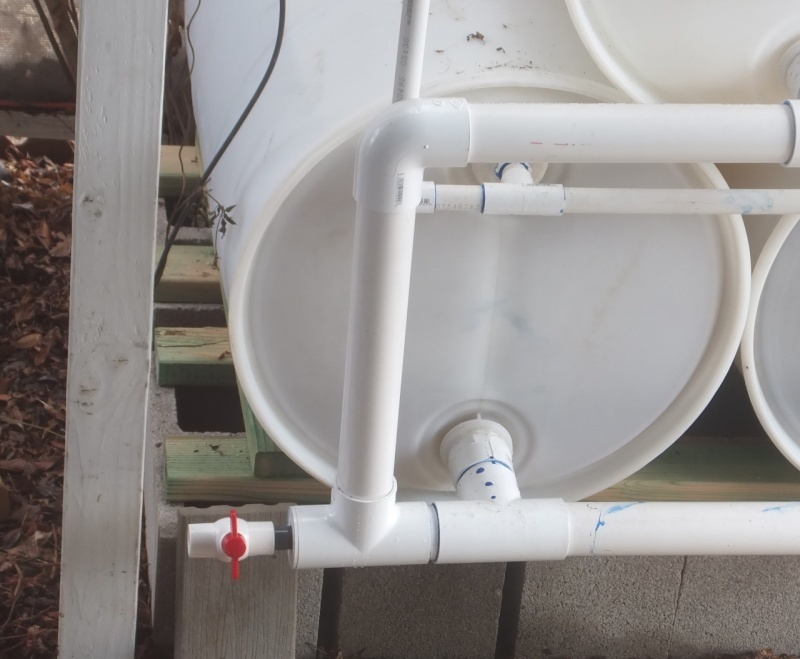 Soooo, for just under $300 we have one rain harvesting system. Sounds like a lot of money just to collect rainwater... and I'm not sure of exactly what we pay for each gallon of water we use (I plan to find out!) or exactly how much we use in our yard and gardens (will be checking on that too!!). What I DO know is that these two systems will help us stay off the public water utilities and doing our part to help with our drought here in CA. This is a really GOOD feeling! Please post a photo today. I CAN'T wait for another photo until after Friday's rain. About the cost per gallon?? Think of it as a capital improvement. Like the first year's expense for SFG. They should last for several years. I have been thinking about all of you California gardeners for awhile and your drought conditions. I hope this rain will help get you at least a little bit out of the drought. It would be wonderful if you could get some rain every week for awhile to catch you back up as long as it doesn't create too many problems because your ground is so parched. I will keep you in my prayers for relief from the drought! Your water collection system is amazing! I agree with Sanderson that you should consider it a capital improvement. What a load will be lifted off your minds as you use your collected water! We started with some light rain here today and it has picked up and been steady. We are not in the severe drought conditions as you Californians but we do have some worries. Rain is such a blessing, unless you are living on the East Coast. It would sure be nice if the rain would go where it was desperately needed. Well, this is me... make that us, Al and me... VERY sad. ...in our exhaustion after such a frustrating day finishing our project we overlooked some critical items. Ya gotta glue EVERY fitting that needs glue and ya gotta fill EVERY fitting that needs the silicone sealant. ALL OF THEM! The bottom barrels are full and there is some water in the top barrels. You can see the water line on the far left barrel, just about where the black dripline is resting against the barrel from the overhead hanging basket. 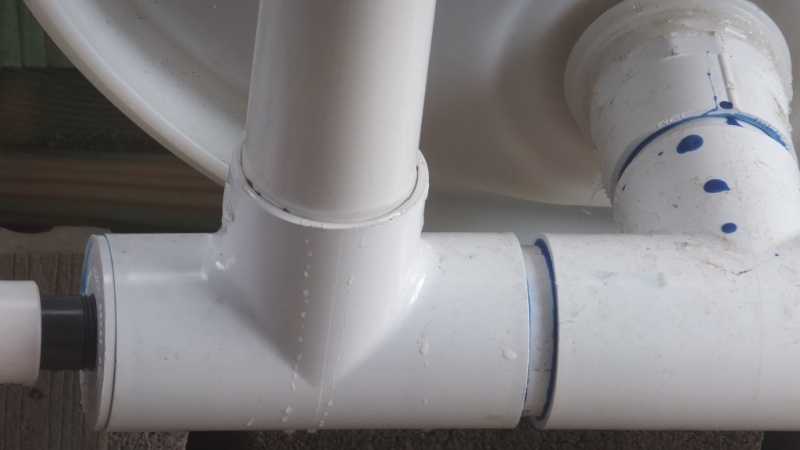 ... and the next not so smart thing we did... failed to do... is glue the upright 2" pipe and fittings ... the tee near the spigot, the piece fitting into it, and the 90° fitting above that. How the heck did we miss this??? A closer look at why glue is so important! DUH. Even messy gluing. We will fill all four fittings in these bottom barrels with as much silicone sealant as we can, and do the top barrels again just to make sure we don't have more leaks. Al went back to work this afternoon so dejected. Hours, make that days, spent working on this only to find these things we overlooked. He was ready to just tear it apart and begin again. I wasn't. So glad he had to go back to work and I had time to think... and do something he didn't want to do. Maybe my plan won't work, but for now it looks hopeful. Al thought there wouldn't be enough flexibility in the 2" pipe to knock off the 90°, pull up the pipe out of the tee, and and then glue them and get all the pieces back into place. Yeah, it was a really tight fit... I didn't know for sure if it would work but after tapping the 90° fitting off and pulling out the upright I just took a deep breath and went for it! Glue on six parts all at the same time... inside and outsides of the fittings, then trying to force them back into place. Somehow I did it! ... and ... I didn't get glue on my clothing, shoes, or anything else. Well, a little on my fingers, but hey, after pushing and pulling on those parts... I'm amazed nothing broke! 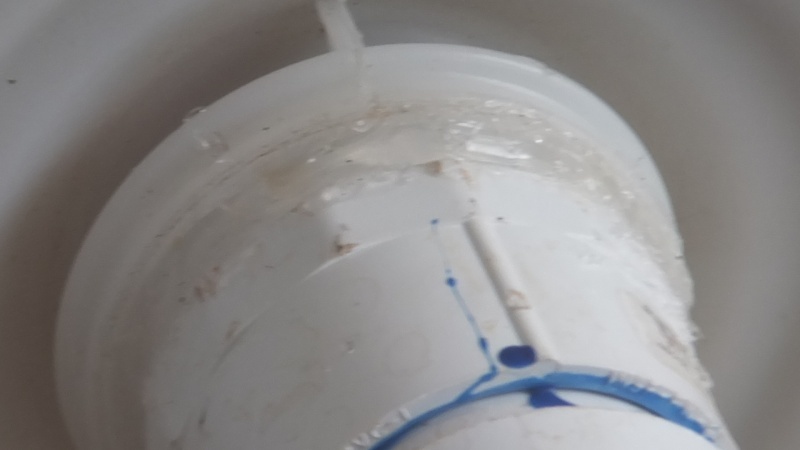 When Al comes home he can put the silicone sealant around the bung fittings and rehang the downspout... and we should be ready for the HUGE storm coming in late tonight or tomorrow. Bottom line here... overall this system works. Ya just gotta take it one step at a time, finish sections one at a time, and triple check everything! Please DO attempt this at your home... without getting too "preach-y", I sincerely believe we all need to use in the best ways possible what Mother Nature gives us. I'm sooooo sorry there were problems, after all the work. The bright spot is that there is another rain tomorrow to test today's fixes. Aren't there soft compression disks (Senior moment here, I can't think of the correct word!) that are used on both sides of a bung, and then you screw the two parts together until there is a water proof seal. Washers! That's the word! You guys are our inspiration right now. @sanderson wrote: Aren't there soft compression disks (Senior moment here, I can't think of the correct word!) that are used on both sides of a bung, and then you screw the two parts together until there is a water proof seal. Washers! That's the word! With closed barrels having non-removable lids how can you get inside to put the washers on and screw the two parts together?? @sanderson wrote: you guys are our inspiration right now. ... but thanks for thinking we're an inspiration... I'll take the beer, OK?? Sometimes mistakes are the best lessons. Thanks for the details. I love your chutzpah! Getting at it before Al got home. Watta gal! @kauairosina wrote: I love your chutzpah! Getting at it before Al got home. Watta gal! OMG...if you only knew!! Al and I have been together just 7 yrs (we're 66 yrs old) and when he wanted to buy an engagement ring, lots of $$s, I wouldn't even look at them. However, while strolling hand in hand through the Craftsman tool area one day I nearly yanked his arm out of the socket dragging him over to see a gorgeous table saw that I wanted!!! Sometimes I get into a bit of trouble doing things that he would like to do for me... that's where all those "tight lipped" moments happened while building our rain collecting system. I try, oh my gosh how I try to let him just do the stuff... ! He's such a sweet guy, couldn't be without him, but raising 2 kids as a single mom, along with my dad's "engineer genes" in me being pretty strong ... sometimes it's really tough to step back and shut up and let him do things his way. How goes the rain collection system?? Hey Hi! I haven't posted anything here in over a year, so many other things in life get in the way! Our Apollo Garden is still growing, some of the same original gardeners, a few new folks. Our biggest challenge right now is of course, the drought. Last week our park manager drove by the Garden and told one of the guys he couldn't water on that day... we're restricted to just 2 days per week right now ... before 9am and after 7pm on Wed & Sun only. Remember those rain collecting barrels I wrote about a year or so ago? WOW, sooo glad Al & I made those two sets of barrels!! We water many of our landscape plants now with that water, and one of the days when our entire park was without water for over 13 hours, without warning... we used some of the water in small buckets to fill the toilet tank! In spite of the serious water shortage Al has some great stuff growing again this year...he brought in a beautiful tomato today, the first of many to grow! The cucumbers are doing well, soooo tasty, not bitter at all. Sadly, all the squash plants became meals for those darned cutworms ... planted 3 times, not planting them again. Maybe in containers in our yard. Probably the worst part of the drought around our yard is having to turn off our fountain. The sound was so peaceful but the little critters that used it daily are leaving our yard. Few hummingbirds... such fun to watch them dart in and out under the falling water. The larger birds like blue jays and mocking birds fighting for bath time. The tiny lizards zipping around when the birds were out of sight. With the water off, no sound of falling water to attract the birds means the birdfeeder is full all the time... with seeds, not feeders! We don't see much of the Cooper's hawk that used to hang around our front porch waiting for lunch. My next project is to try and rig up a hose from the house, the washing machine hose, to a collector barrel outside for the gray water. If I do my laundry on Tues & Sat we can keep the water to use on Wed & Sun. ahhhh, that's just silly. With gray water I can water any day of the week! Good to be back here again, as I strolled through the site I see so many of my old "friends" still here! Yay!! Have you added any mulch to your gardens? We have added 2-3 inches of ramial wood chips to the tops of our table top and raised beds. Ramial wood chips are the chipped up branches of trees under 3 inch diameter which is of a different substance than bark or trunk wood. They hold the water in really well and the worms LOVE to eat it and turn it into vermicompost right in place. Our landscape gardens get 4-6 inches and we only have to water once a week. We bought plastic tubs that go into our kitchen sinks. When we're done with the water we pour it into a 2 gallon bucket and carry it out to the garden. 2 gallon size is not too heavy to carry and is just about perfect for the amount of water we use. I've even started doing the same with our bath tub shower. Every little bit helps! Welcome back, hope you'll be a regular face around here again, you're a great addition to our community. Hi PNG_Grandma! I was wondering how your rain barrels were working. It has got to feel nice to know that even without the water system operating, you can flush the toilet! Fresno had a black out years ago that affected the water pumps. We quickly filled a bathtub with water for flushing and showering, and clean containers in the kitchen for drinking and cooking. Audrey, you are certainly doing your part on water conservation. Good to see all of you again! Our rain barrels are being used, and refill with the smallest amounts of rain! Mind boggling how little rain will run off the roof and fill those 55 gal barrels! Hi PNG_Grandma! Good to see you again as well! How are you? And the garden? Hi everyone, just dropped in from Canada to read this thread so read the last few pages to find out all about PNG_Grandma's efforts at rainwater barrels. Thoroughly enjoyed reading the set-up. I think you and Al make a great team. One thing about storing water, I do hope you never have the powers-that-be say you cannot harvest the rainwater falling on your roof the water does not belong to you. I think that is a stupid idea, as IMO the water is being used not wasted. The water used is returned to the ground and eventually goes on its way to where is was going in the first place. @Kelejan wrote: One thing about storing water, I do hope you never have the powers-that-be say you cannot harvest the rainwater falling on your roof the water does not belong to you. Nice argument! Makes sense IMHO. This makes sense to us too, and each time someone on Facebook or elsewhere tells me it's illegal to collect the rain water I go through and search again ... so far here in CA where we're still in such a drought, we CAN collect the water. I just hated to see so much of it running off my roof onto the ground during the past few weeks when we've had rain!! All 14 of our barrels are full and I have no room to set up any more. I wish our manager would allow me to set up the same system on the other side of our property line, in the Apollo Garden site. The water from the rest of our roof could easily fill another 14 barrels so quickly, and the gardeners would have water during our dry seasons. So far the answer is no, they say it wouldn't look good. Geesh!!! sigh. I think barrels with life giving water are prettier than dead landscape. @Scorpio Rising wrote: I think barrels with life giving water are prettier than dead landscape. You're so right! But for us it's not landscape, we're trying to harvest water so we can harvest from our Apollo Garden! Here in Modesto we're down to watering one day a week. Gardens need a bit more than that so we want to have rain barrels of water to use on the other 6 days of the week. We won't give up!